Úvaly probably originated thanks to colonization of the region around Valtice. Passau bishops colonize the territory after the so-called. Regensburg peace in r. 1041, when the region north of the Danube belonged to the German Emperor Henry III. Year 1269 - this time comes from the first written mention of "Garssenthalu". 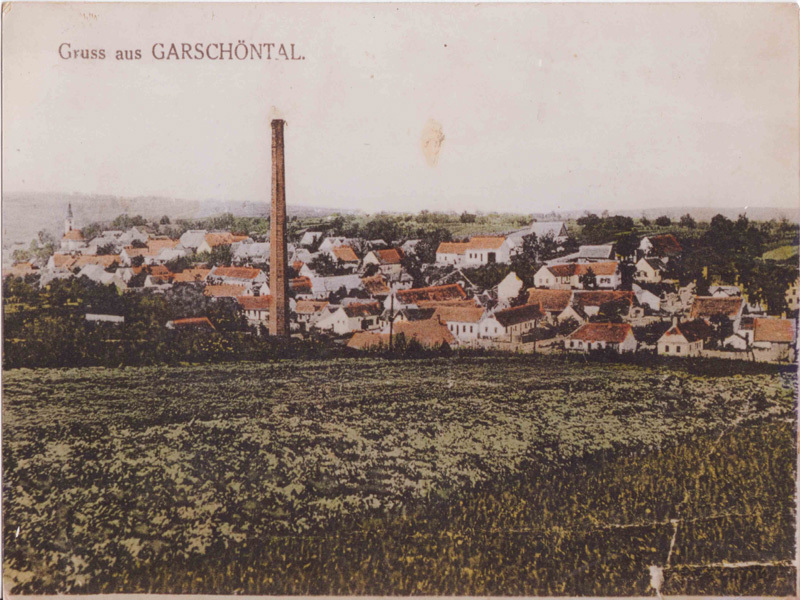 Later Garschönthal from the very beginning dependent on the nearby Austrian estate Falkenstein (today a popular tourist sight of the ruins of the brooks). During the Hussite wars the village and its population suffered greatly as a result of their position. In the years 1841 - 1843 was built a larger chapel, since the current one only accommodate 50 people and in 1883 the church was built in its present form and ordained. Administrative jurisdiction of the village was later changed frequently. The initial connection to the district Poysdorf disappeared after the formation of the judicial district in Valtice r.1867, and after connecting to the Czechoslovak Republic Úvaly were connected to the district Mikulov.At peak times in the village were: 2 blacksmiths, bakers, tavern, carpentry, 4 shoemakers, 2 barbers, firehouse, brickworks employing about 60 people. There is a great tradition of winemaking, Úvaly been known extensive wine cellars. After 1968, a large part submerged. In April 1945 the village was occupied by Russian troops and the following year began displacement of local people of German origin. 85% of them remained in Austria, 15% moved to Germany and two residents settled as far away as Australia. Elementary School disappeared, and instead of displaced people came people from inland, largely without regard to the local landscape. Entire property and a brickyard have been demolished. Building material was largely driven to Valtice. All contemporary and stylish facilities were burned or destroyed. In 1964, these were already in a declining village, merged with nearby Valtice. In the following decades, the village located on the front line of the Iron Curtain, the entrance was just a pass, everything was patrolled by border guards and ubiquitous construction or maintenance of houses have been disabled. In the aftermath of the 1989 revolution, was abolished border regime. Úvaly were only gradually colonized and recovering from previous years. In recent years, in Úvaly starting to renew old traditions such as Úvaly feast and repairing and rediscovering wine cellars. In 2007, with the assistance of the European Union was corrected nearby úvaly pond. In 2008, residents and tourists were greatly helped by the introduction of the Schengen Area and therefore the abolition of border controls. Famous people: Johann Rudolf Geist (* June 13, 1900 Úvaly, +28.04.1957 Vienna) - poet and storyteller. There is village filial durch of Stanislav which has been built around 1800 in the Classical style. It is a single conscious building. Interior of the church, dating from the time of its construction, form the altarpiece of the Madonna with elements of folk art, three-piece baroque organ cabinet with carved, gilded wooden candlesticks and a wooden railing filling between the chancel and ships. Statue of Christopher near the church dates back to the second half of the 19th century.